Steve Stevens escorts 20006 Mayors' Ride riders down Golden's Main St.
For almost as long as we have run Mayors' Rides, HiWheel legend Steve Stevens has been trying to get his home city, Golden, CO, recognized as an official NBG Mayors' Ride city. Well, here as I upload the actual coast-to-coast National Bicycle Greenway route for "How America Can Bike and Grow Rich", I am discovering that a regular visit to Golden does make sense. I had been waiting for the bike lanes on US-36 to be complete. Projected for 2015. they will make for a straight shot from Boulder to Denver. However, state route 93 that connects to Golden, though it does represent a small 5-10 mile detour, has a shoulder that has been upgraded well enough to satisfy Steve. And once we get there, our path to Denver will get us back on US-40, an historic road that dates back to 1926. Once called the Victory Highway, it ran from San Francisco to Atlantic City, NJ. One of America's first coast-to-coast roads, as a US highway, the ascents and descents on US-40 have all been graded so there is not constant up and down hill work. Largely abandoned in favor of Interstate 80, we will have used it to get over the Wasatch Mtn Range in Utah, most of the Rockies in Colorado, most of Indiana and some of Ohio before we end on the C&O Canal Towpath in Washington DC. Upgrading those section of US-40 that we will be using to the NBG shoulder spec should be fairly easy to accomplish over the next 5-10 years. Golden has the largest Brewery in the World (Free Tours, Free Beer)! 3) It has a Bike Park – with Mountain Bile trails, Pump Park, etc… It was established before Denver’s or Boulder's. 4) Yeti has their bike factory here (all hand made bikes)… the workers ride on Lunch hour up Lookout Mountain from the factory door. 9) Each of the last 3 institutions came here in the last 10 years – rather than locating in Boulder. 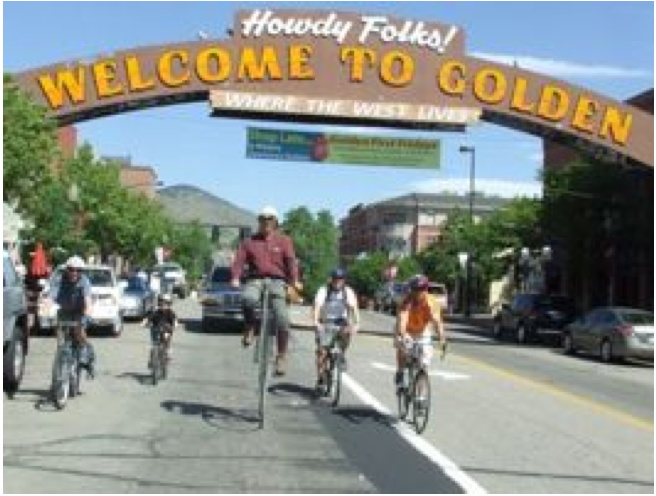 10) Golden was just ranked number 2 in the USA for Livable Cities in the small city class…. Announced in the last 6 weeks. 12) It has a professional White Water Kayak Course – and hosted the National Championships a few years ago. 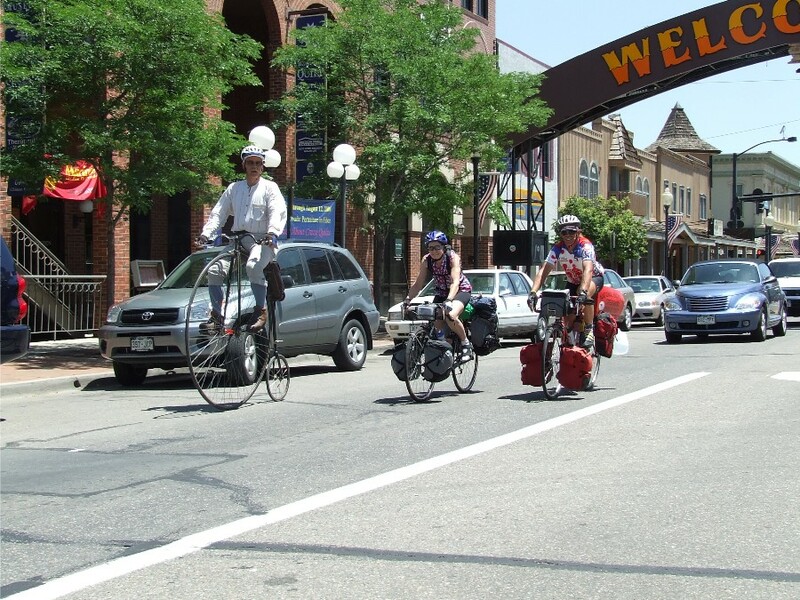 13) It is a Bicycle Friendly City – more than you can Imagine. 16) It was featured in the Movie “American Flyer” about the Coors Classic. 17) It has the Mountain Climbing Classes for the Mountaineering Center… on real mountains in Golden. 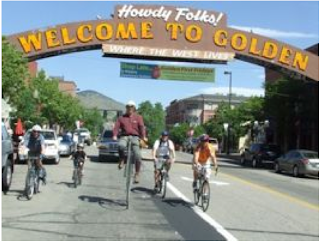 19) Golden had a cyclist (Jim Boyd) who rode in 1869… on a Velocipede. 22) You can successfully pan for Gold in Golden. On bike rides you see folks doing it. 23) You can hang glide in Golden from Lookout Mountain. 24) Buffalo Bill chose Golden for his final resting Place. He is here … as is his museum. 25) You can ride from my museum at 5900 ft elevation to the peak of Mount Evans (14,370 ft) and back and call it a century – all on paved roads..The only possible century on paved roads to the top of a 14er mountain from a bike museum.